eCRATER Somfy Silent Block Idler Bracket 10mm I.D. 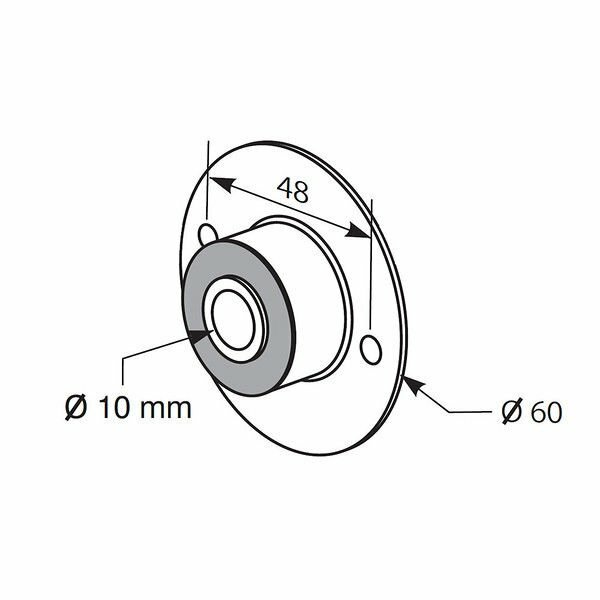 for 500 Series PRODUCT DESCRIPTION Zinc plated steel with a 10mm round insert surrounded by rubber. Compatible with matching motor bracket Cat. #6070238. Can be mounted on Cat. #6070526 (94106370). Maximum motor torque - 20 Nm. Can reduce sound levels by 4-5 dB.Maximum system load Note: Maximum system load will vary depending on application. SOMFY recommends testing of component in actual application to determine its suitability . DETAILS Zinc plated steel with a 10mm round insert surrounded by rubber.Maximum motor torque - 20 Nm. Can reduce sound levels by 4-5 dB.MPN # 9701310 SHIPPING INFORMATION Our stock all ships from our US-based warehouses. Shipped via USPS or UPS or FedEx (depending on location and package weight) eCRATER Global Shipping Program - We are a part of eCRATER Global Shipping Program. This means that eCRATER will be responsible for shipping and import charges and times. We don't control the shipping times and import charges, which are based on your location in the world. You can find all the info in the eCRATER listing! RETURN & REFUND POLICY We offer a 30 day return/exchange policy for our products. You can choose refund or exchange if you are dissatisfied for any reason with your product. For returns, please go to your eCRATER account, select your purchase and request return. Failure to do so will result in delay of refund. Include your name and order number. Mail back returns to (May not be the same as the return address on you parcel, we ship from multiple warehouses) Amazing Drapery Hardware, 1305 NW 155th Drive, Miami Fl 33169 Buyer pays return shipping. When returning an item, it must be in all of the original packaging and include all of the original accessories or items that came with it. The item and package should be in original and perfect condition. We are extremely fair, and in the rare event of something out of the ordinary happening with our products or shipping, we will gladly work with you to find a solution. Buyers outside the U.S.A please note - ALL of our electronics sold in our store are 110-120V. When sending in a return, please note that it can take up to 7 business days for the return to be processed. We do our best to process as quickly as possible. About US As a third generation Hardware retailers, we know how important service and selection is to our customers. Amazing Drapery Hardware specializes in supplying the window treatment parts and supplies to repair and build beautiful window treatments. Simple window treatment DIY's can bring function and distinction to your home, we offer the tools, and that helping hand we all sometimes need on that one time project. Whether it is to repair what you have and give your treatments the longer life they disservice or to create something new and exciting, We can help provide you with the Confidence, Quality, Selection, Value you need, with Easy Returns. 10 QTY - Wood Shade Slats - Length : 72"
C.S. Osborne & Co. No. 505 Straight Double Rd. Pt. - Size 6"